Initial Goal: To cause your online visitors to read and share your blog content. Ultimate Goal: To grow traffic to your site and ultimately to generate leads because of your blog. Get your users to click on your blog by promoting it on your homepage. Link to a blog posts from a side bar that randomly refreshes as new posts come up. Add a question or a heading that will draw attention to the user. For example: “Ever wonder what the best time is to send an email?” Link this to your most recent blog post about when and how to send emails. You can also add your blog’s RSS feed to the bottom of your homepage. Use analytics to find out what blog pages on your website get the most traffic then add Calls to Action on all of these pages. Send out emails to your potential leads and your existing clients. Announce that your blog is live and constantly being updated. Link your most popular articles in the email as a way to get your recipients to visit the blog right away. This email and your call to action can help facilitate relationship-building and relationship-strengthening. Include in your email articles a catchy heading that you know relate to your target audience. Make sure to also include a link to subscribe to your blog in the email. Don’t let your thank you pages go to waste. You may be tempted to throw together a thank you page in 30 seconds and just forget about it. But wait! You can do so much more. This is your opportunity to bring your leads and clients back to your blog. Add a link to subscribe. Add a link to a blog post that relates to the page or form they were just on. Use this as another chance to grab their attention and point it to where you choose. Each person in your company should add your blog URL to their social media profiles as well as their email signatures. You want to make sure your blog is being shared through social media sites as often as possible. 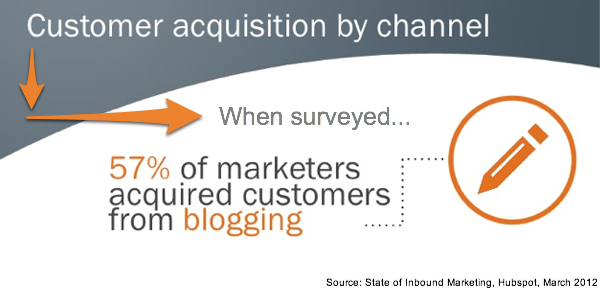 If you are B2B company, you should be adding your blog posts to LinkedIn and Twitter. If you are a B2C company, you can add yours to Facebook and Twitter. Be sure to have all of your employees (and you too!) subscribe to your blog. In doing so, you will help get more people involved. Each time someone reads a post, they can comment, they can participate in the discussion, and they can also learn more about the company’s initiatives and goals. By keeping your blog fresh, new, and updated (at least weekly), you will generate more leads and will continue to encourage frequent visits to your website. With these 7 easy steps, hopefully you’ll find that promoting a blog really isn’t that difficult! It just takes some time and commitment – a cost that is well worth the benefits you’ll gain from running a healthy blog.